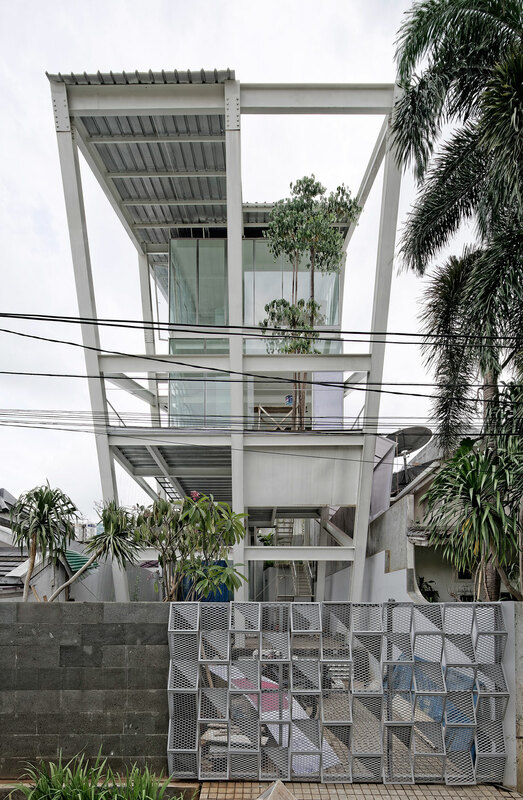 Located in a gated community in the Pondok Indah district of Jakarta, Indonesia, this new private residence stands out for its daring and iconoclastic architecture that turns, almost literarily, the concept of the suburban house on its head. 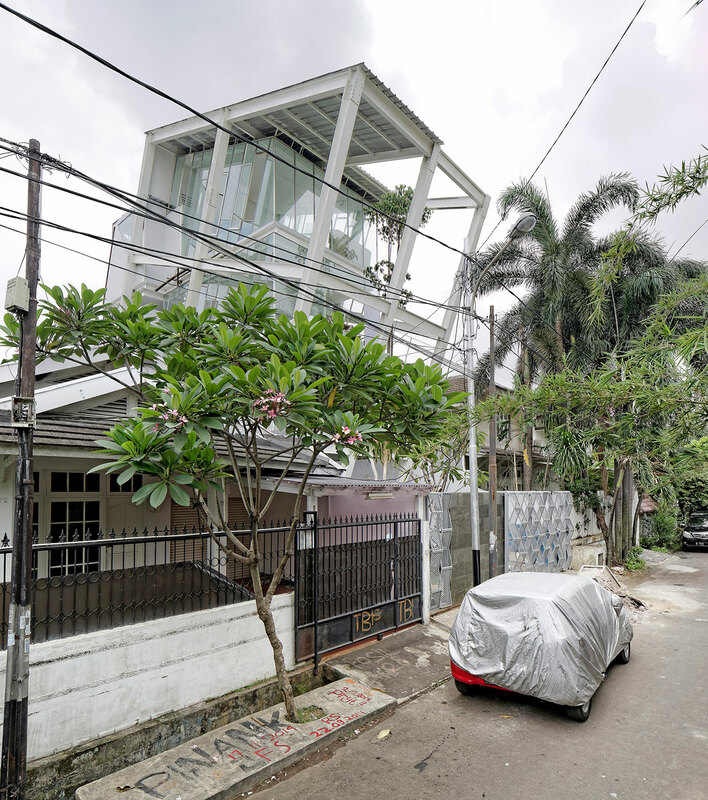 Designed by Budi Pradono Architects as both a “critique” and an “antithesis” of its upscale suburban environment, Rumah Miring (Tilted House in English) looks nothing like the neighbouring residences and their mock-European aesthetic. 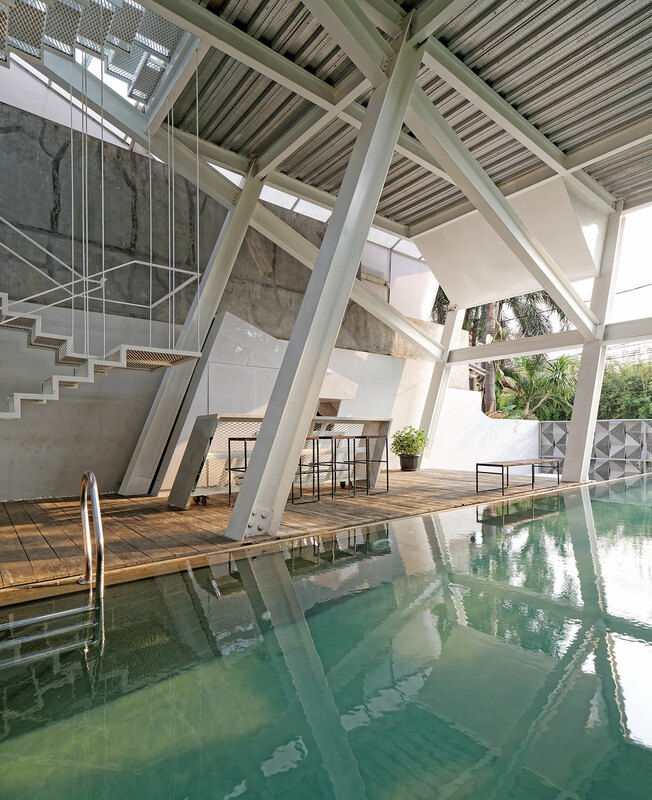 Its slanted steel frame, tilted 20 degrees from the vertical, takes the form of a white exoskeleton leaning towards the street and rising precariously above the adjacent terracotta-tiled roofs; meanwhile, the house’s interiors are completely encased by glass walls, their angled glass-panes aligned with the structure’s tilt and providing the owners with breathtaking views of the area. 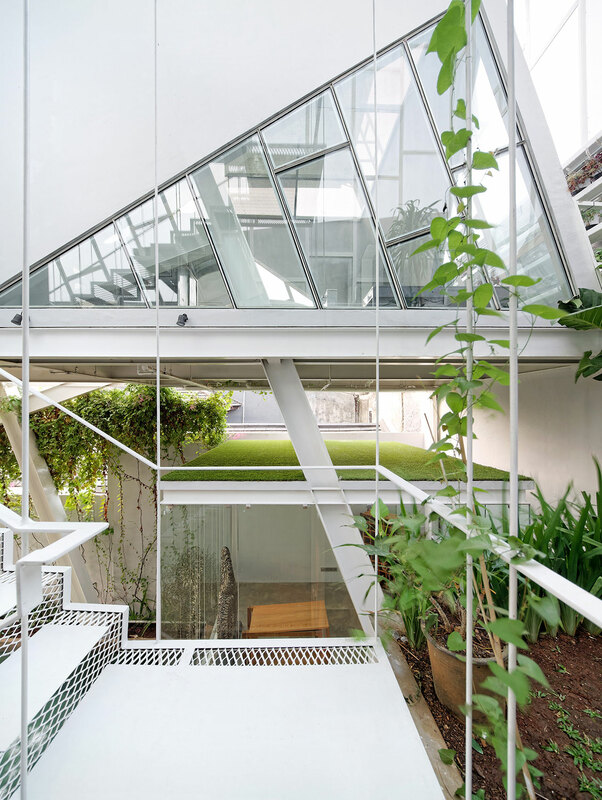 The house sits on a quite narrow 8 by 20-metre plot and occupies three floors. 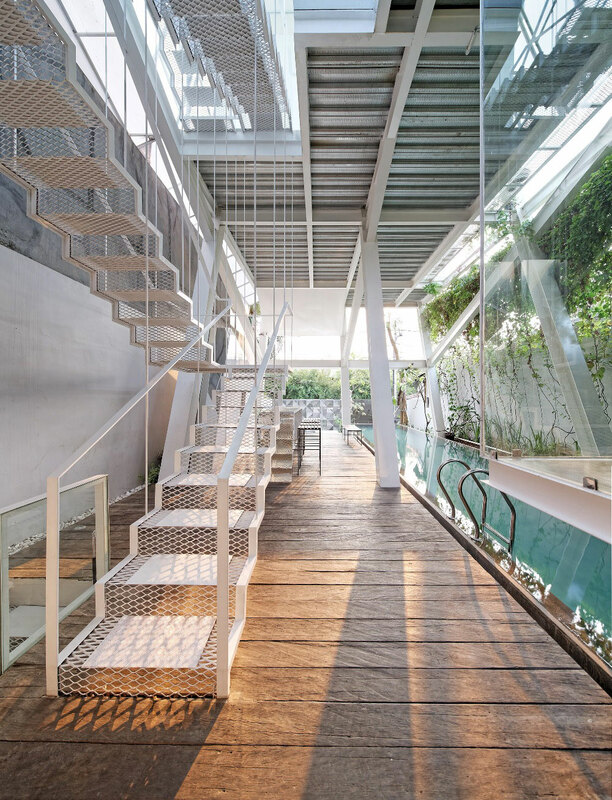 An elongated pool and an open-air pantry occupy the ground floor, with a glass-box housing a study hovering above on the mezzanine level. 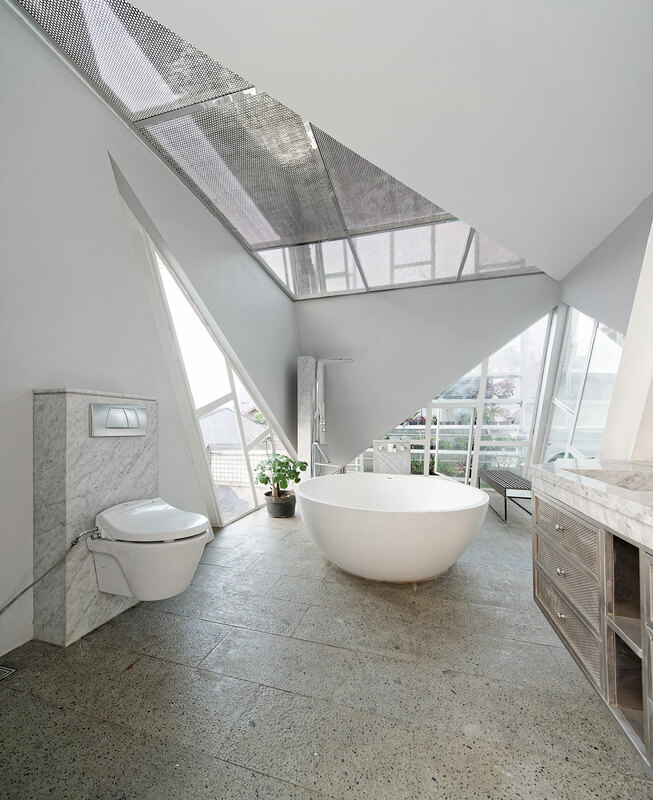 The private areas of the house, master bedroom, wardrobe and bathroom, are located on the first floor with the latter spaciously designed as “a contemplative room as well as a resting place”. Finally, the living room on the top floor has the best views of the city whereas a guest room located on the back of the house retains a sense of privacy. 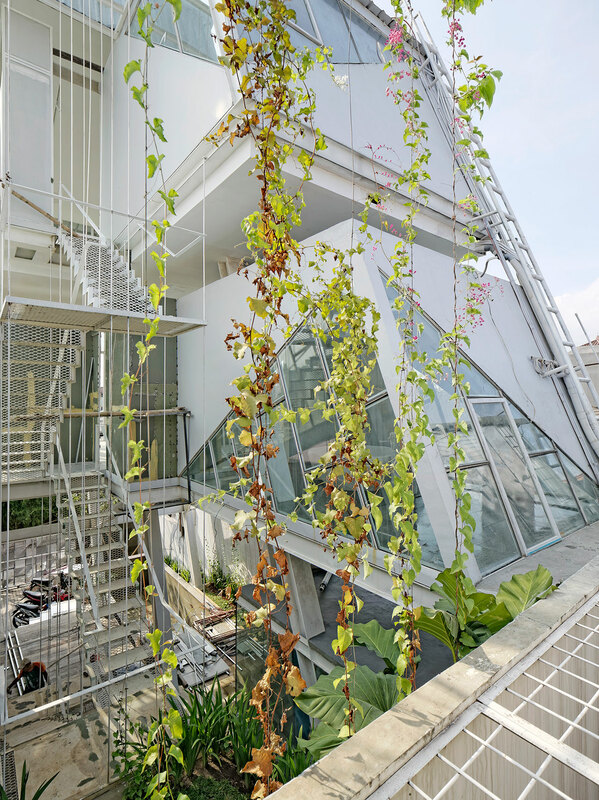 Keeping with the overall minimal and lithe aesthetic, the architects have designed floating stairs of white metallic mesh with opaque treads connecting all floors while also adding climbing plants around the building to provide a sense of colour and softness. 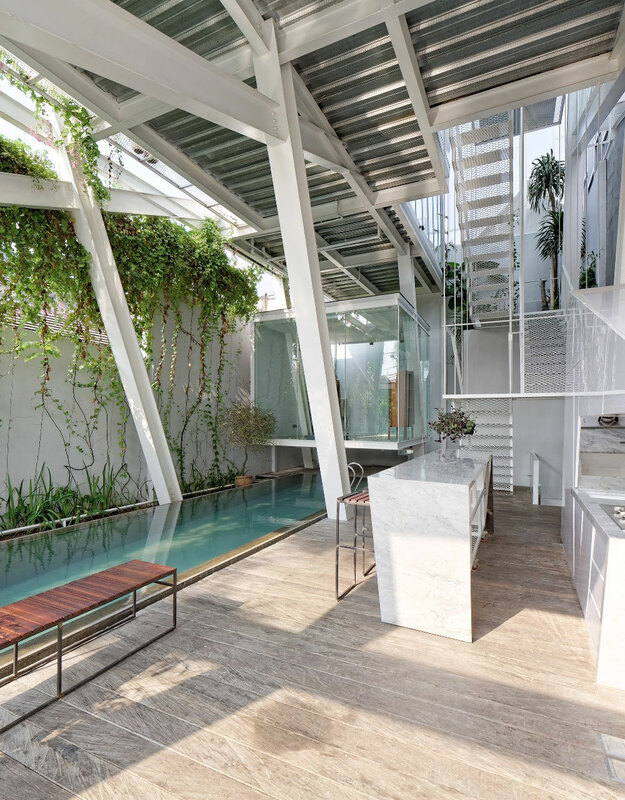 But the main feature of the architects’ green intervention has to be the slender tree growing on the master bedroom’s decked terrace: reaching all the way up to the living room on the floor above, its stretched verticality creates a playful juxtaposition with the house’s slant and enriches the view of the city.